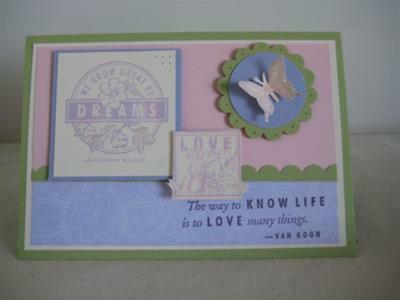 I only used the Dreams du Jour stamp set for this card, it is so versitle. I have used Certainly Celery, Very Vanilla, Pink Pirouette and Almost Amethyst card stock, Pink Pirouette and Almost Amethyst ink. I have used the Scallop Circle punch with paper piercing and the Long Scallop punch. There was no real inspiration behind what I have created, it all just came together. I hope you enjoy, and look forward to the next challenge. Join in and write your own page! It's easy to do. How? Simply click here to return to Colour Challenge Competition May 09.